"... Daniel Island's prime location offers residents almost unlimited recreational and cultural opportunities." It took years of thoughtful planning and vision to make the thriving community of Daniel Island a reality. Not long ago, the island, which is within the Charleston city limits but also in Berkeley County, was nothing but acres of farmland and marshes. Now it is a nationally acclaimed town designed to provide its residents with a true feeling of community - a slow-paced, small Southern town in a modern setting. 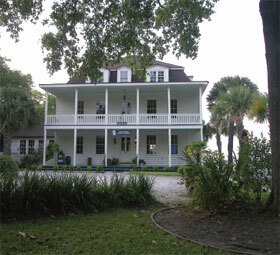 Daniel Island's developers incorporated many historic design features of the neighborhoods of downtown Charleston. The homes are set close to the quiet, meandering streets to enhance the neighborly feel and feature large covered porches, ideal for chatting with neighbors. Wide sidewalks crisscross the island, making walking to stores, schools and parks a practical proposition. Everything residents need, from dry cleaners to dentists, is available on the island. It wasn't always so. Named in honor of Robert Daniel, an early governor of South Carolina, the island was at one time made up of several large plantations. Harry Frank Guggenheim bought the island to use for cattle farming and as a family hunting and fishing retreat in 1947. When he died in 1971, the land was passed on to the Harry Frank Guggenheim Foundation. Daniel Island features several spacious parks with playgrounds and open grassy spaces and is home to a golf course designed by Tom Fazio that is rapidly earning a reputation as one of the best courses in the area. Each April, the world's best female tennis players compete in the Family Circle Cup at Daniel Island's Family Circle Tennis Center. The stadium also hosts Davis Cup matches and is a popular venue for outdoor concerts. Blackbaud Stadium, one of the country's premier soccer-specific stadiums and the home ground for the Charleston Battery, is also on Daniel Island. Just minutes from Mount Pleasant, downtown Charleston, area beaches and the Wando River, Daniel Island's prime location offers residents almost unlimited recreational and cultural opportunities.